"When the Palestinian state is created, I will be able to go to Palestinian citizens, who we call Israeli Arabs, and say to them: You are residents with equal rights, but your national solution is in another place". With the above words, Israeli Foreign Minister Tzipi Livni addressed a group of young high school students in Tel Aviv last week. Livni, the Kadima party leader and running candidate for the post of Prime Minister, can’t afford to commit political mistakes during election times. What she said was not a thoughtless blunder; it was calculated, premeditated, and intentional. While Israeli political parties hit the election ground scheduled early next year, all the polls predict a come-back of the Likud led by the radical Benjamin Netanyahu. This political context witnessing the emergence of the radical right wing in Israel is reinforced by the weak position of the Israeli Labor party and its leader Ehud Barak. The ground is now slipping under Kadima’s feet, in particular after the Ehud Olmert corruption scandal. And while the center right electorate seems to be strongly affected by the loss of credibility of its leader, on the further right it looks as if it is time for more unity. This is exactly why Livni is in such fear of loosing the elections, and it is only in this context that her words can be explained. The hopeful Prime Minister decided apparently to play inside the yard of the radical right, and started to borrow their own words and vocabulary in order to seduce voters. However, Livni’s words have more of a dogmatic significance because they were directed to an audience that hasn’t yet reached the legal voting age. Her statement on that specific day reveals that the so called center right in Israel has a radical view of how the country should look after a two state solution is implemented. It is equally not the first time the Kadima leader infuriates Israeli Arabs. Only a month ago, she said that “it must be clear to everyone that the State of Israel is a national homeland for the Jewish people (…), and that the national demands of Israeli Arabs should end the moment a Palestinian state is established ". 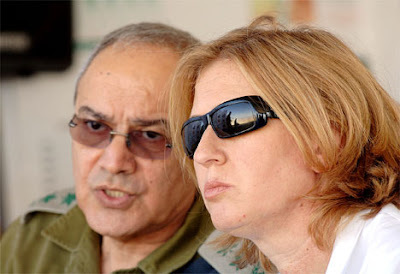 Livni’s words provoked outrage among Arab Israeli lawmakers. Culture, Sports and Science Minister Ghaleb Majadele reacted to her statement saying: "The roots of the Israeli Arab citizens were planted before the state was established (…) and that their residency and citizenship are not open for negotiation ". The electoral bazaar is now open and the Israeli soil looks more fertile than ever to host a cut-throat campaign where dogmas and ideologies are deployed to attract voters. It also appears that Israeli politicians are still somehow dreaming of an exclusive national homeland for the Jewish People. They are not ashamed to exclude or transfer non Jews if at all possible, a practice that reminds strongly of what they themselves had to endure before and during the Second World War. Partisans of such thinking have the right to dream and work for their political project. But it automatically gives the right to those Israelis and Palestinians who disagree, to reject the trap of the two state solution. And hence, it adds legitimacy to any form of campaign for a bi-national state where Israelis and Palestinians can live together under a modern and democratic government. I'm not even sure how they plan to implement this new wave of ethnic cleansing. The two state solution is ancient history thanks to the wall and the ever encroaching settlements in the west bank. Moving them to the palestinian bantustans is un-implementable due to the high population and limited resources of these areas... and can they really risk adding more steam into an already bursting pressure cooker? Other arab countries wont take them in, europe or america wont have them... so what exactly is she saying here? exterminate them? It seems to me that Kadima is digging israels grave. As you say...it seems the Israelis have fallen in the trap of their own greed. Not unlike the White South Africans. As I said in a previous post sometime ago, it is only a matter of time before proponents of the one-state solution start making themselves heard on both sides.